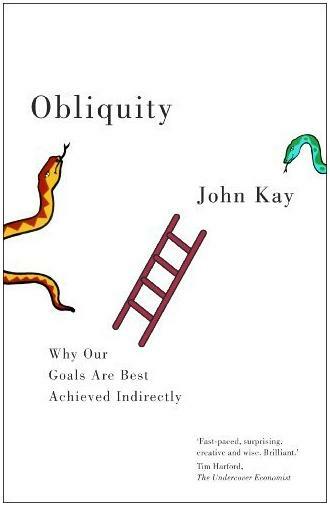 John Kay, Obliquity: Why Our Goals Are Best Achieved Indirectly, Profile Books, London, 2010. I’m left-handed at most things. I can do things right-handed as well. Which really makes ambidextrous. Growing up sometimes this was a problem. I remember having a clear challenge with scissors. The cheap ones that weren’t suited to your hand didn’t cut so well. And, the better cutting scissors were designed for right-handers… At least the ones in our family were. It seemed the world is geared to suit some people better than others. And, this is why John Kay’s book Obliquity is my number one Most Influential Book for 2011. He presents a framework for planning and execution that suits me personally and sits outside the traditional view. The sub-title of this book sums it up: Why Our Goals Are Best Achieved Indirectly. For the left-brain, step-by-step, goal-oriented person this will be the equivalent of using left-handed scissors. It won’t fit! It won’t work. And, it will be hard to get your head around. However, for me, this book validates a life-long struggle. I can point to numerous successes that typically occurred in non-direct ways. I always thought this was odd. Now Kay’s book says this might be the norm. And, I’m pleased to say that John Kay is not some random crackpot with a crazy opinion. Instead, he’s a highly respected economist and professor at the London Business School and the University of Oxford. Credibility is important when you’re presenting a counter-intuitive or contrary view of the world. The book draws on a wide array of examples. It includes the usual business ones – companies who tried to pursue profit only to go broke or perform poorly. Eg ICI, Boeing and Merck. He mirrors one of my other favourite business books Built to Last by Collins and Porrass. Profit is important it’s not the reason a business exists. This fuels my belief in the important of having a clear manifesto to focus attention. How the most profitable companies are not the most profit-oriented. This is a book of practical philosophy. And for me, as one in love with designing processes to achieve outcomes, it is music to my ears. It’s validation that some of my ponderings may be more useful than I had given them credit. And, personal validation is worth a lot. Well, at least the title as the Number One Book on my list of Most Influential Books for 2011. Read it if you’re interested in thinking about how the world works. And in particular, if doing left-brain goal setting doesn’t work or doesn’t appeal. This book will give you a powerful alternative to achieving your goals indirectly. And that might just be the breakthrough you’re looking for.